Healthcare analytics has today metamorphosed from the traditional baseline of reporting tools, spreadsheets, and application reporting modules to predictive and prescriptive analytics models. Most healthcare organizations are focusing on tools like data warehouse, financial and operational dashboards, and clinical data repositories to power meaningful data analysis. It helps care providers to make informed decisions regarding the latest treatments, novel medical technologies, and derive clinical and operational outcomes. However, the healthcare providers and medical institutions need to have optimum knowledge and understanding of the leading tools in the market to develop and implement appropriate prediction models. Medical experts can apply predictive analytics only in a context wherein they can provide with appropriate intervention measures. Furthermore, prescriptive analytics helps healthcare providers with requisite insights on the possible outcomes of certain predictive actions. With so many latest developments in healthcare analytics arena, it has become important for the organizations to select the right technology that fit their need. In the last few months, a distinguished panel comprising of CEOs, CIOs, VCs, analysts including Healthcare Tech Outlook’s editorial board has reviewed the top companies in the healthcare analytics space, and shortlisted the ones that are at the forefront of tackling industry challenges. The selection panel looked at the vendors’ capabilities to fulfill needs of buyers with effective solutions that curb the challenges associated with healthcare analytics. 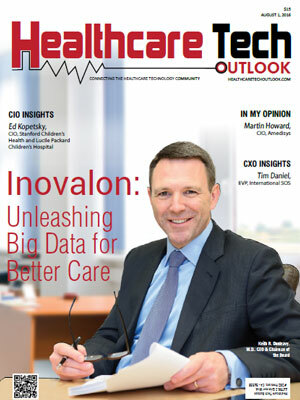 In this edition of Healthcare Tech Outlook magazine, we present to you “20 Most Promising Healthcare Analytics Solution Providers 2016,” featuring the companies that are creating an impact in the healthcare sector.